This is the website for the Shiny Train-the-Trainer Certification Workshop. This workshop will be offered January 15-16, just before rstudio::conf 2019 in Austin, TX. The workshop is designed for those who want to up their teaching Shiny game, and is particularly aimed at training partners who want to qualify as an RStudio Certified Shiny Instructor and at those who are R and Shiny advocates in their organizations. Principles and theory of teaching and learning. How to start a workshop and serve the cake first. How to pick content, and adjust to workshop focus/level to audience. Writing learning objectives and content outline for workshops of various lengths. Structuring information delivery and activities. Delivering materials with little friction. Teaching the challenging bits – testing, debugging, performance, deployment. Prepare and teach your own demo! This two-day workshop will equip you to teach R effectively. We will draw on RStudio’s experience teaching R to recommend tips for designing, teaching, and supporting short R courses. On Day 1 of the course, you will learn practical activities that you can use immediately to improve your presentation style, learning outcomes, and student engagement. You will leave the class with a cognitive model of learning that you can use to develop your own effective workshops or courses within your organization. The course will also cover how to use RStudio Cloud and its curriculum of tutorials to jump-start your own lessons. On Day 2 of the course, participants will have the option to choose one of two tracks: Teaching the Tidyverse or Teach Shiny. In the Teach Shiny worksop classroom examples will focus on teaching Shiny at the beginner and intermediate levels. The course materials will build on RStudio’s Mastering Shiny workshop as well as the upcoming book from the author of the Shiny package, Joe Cheng, and they will cover the entire lifecycle of a Shiny app: build > improving > share. Participants will receive the course materials for teaching Mastering Shiny. 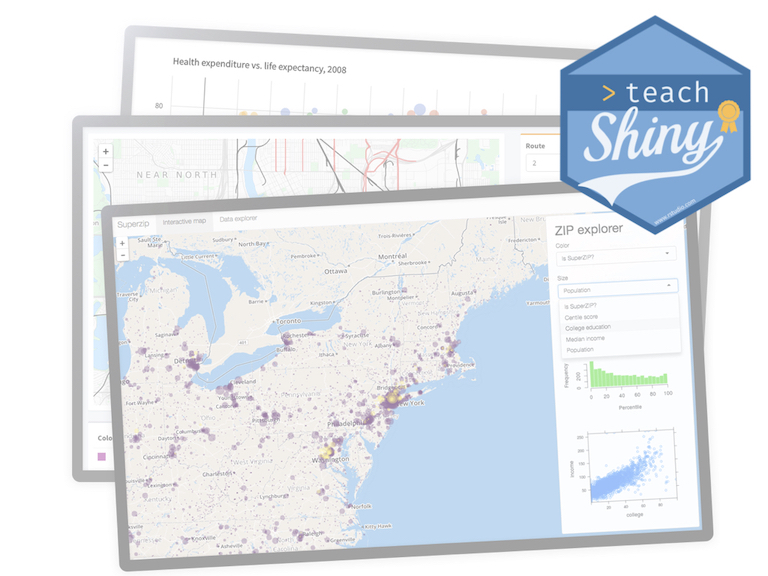 You should take this workshop if you work as a training partner and want to qualify as an RStudio Certified Shiny Instructor or if you are an advocate for R in your organization. You should be proficient in Shiny already and be prepared to submit examples of your work. Prior teaching experience is helpful, but not required. Please bring a laptop and a device that has video recording capabilities (such as a laptop or cell phone). Day 1 of the course will be co-taught by Mine Çetinkaya-Rundel, Garrett Grolemund, and Greg Wilson, RStudio Data Scientists and Professional Educators. On Day 2, Mine will teach the Shiny track and Garrett will teach the Tidyverse track.